Length of a Celebrant Wedding Ceremony - how long? The bottom line is that the wedding ceremony can take however long you want it to take. But for any number of guests we srongly advise that you do not have a ceremony which is too short. Celebrant wedding eremonies are very often criticised because they are too brief - "it was over before it started". And here is a good rule. The more guests you have the more meaning and substance (length) you should have in your ceremony. For some reason, the bigger the group, the longer they take to "sink" into the ceremony. Some couples react to some long impersonal church ceremonies, which they have found insufferably boring. A personally planned celebrant wedding will never be like that ! 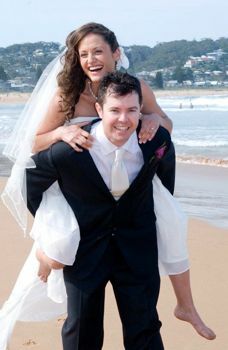 A good celebrant will ensure that everyone feels part of the action. Rehearsed readers, the personal story, and sub-rituals like ring "warming" are all good ways to do this. So are responsorials, vows of the guests to support the couple, and especially singing together. How long should a ceremony with 100 guests be? My feeling - about 20-25 minutes for the ceremony proper - add the Processional in to music - and after the ceremony proper - add the signing of the register and marriage certificates (inc photos) within the ceremony - add the Recessional to music- about 30 to 35 minutes altogether. We are including in the ceremony proper, the introduction and welcome, the personal story of the couple, say, four well rehearsed readers, the Monitum, the Asking, the Vows and Rings. What people do not realise is that many parts of a ceremony do not take very long at all. I can honestly say I do not recall anyone ever complaining that a ceremony was too long. I have heard hundreds of criticisms that a ceremony was too short. Guests did not feel they had "their money's worth". - they say to a celebrant - "we just want something short and informal" which is an invitation, to a low standard celebrant, not to spend due care in preparation and rehearsal. Proceed with care.